Question: How do I know when it is time to retire a rope? Samson provides a basic checklist (for a copy of their pocket checklist with pictures, please visit the Rigworks store or contact Samson directly at www.samsonrope.com. Cut Strands – two or more cut strands in proximity caused by abrasion, sharp edges and surfaces, and cyclic tension wear. If possible remove the section and resplice. If this is not an option, retire the rope. Compression – visible sheen stiffness reduced by flexing the rope caused by fibers molding themselves to contact surfaces under radial load. This is does not warrant replacement. Simply flex the rope to remove compression. Pulled Strands – strands pulled away from the rest of the rope but not cut or otherwise damaged. This does not warrant replacement. Simply work the pulls back into the rope. Melted or Glazed Fiber – fused or visibly charred and melted fibers, yarns and/or strands that display extreme stiffness that is unchanged by flexing. If possible remove the section and resplice. If this is not an option, retire the rope. Discoloration/Degradation – fused or brittle fibers and stiffness caused by chemical contamination. If possible remove the section and resplice. If this is not an option, retire the rope. Inconsistent Diameter – flat areas, lumps and bumps caused by shock loading and broken internal strands. If possible remove the section and resplice. If this is not an option, retire the rope. Abrasion – broken filaments and yarn caused by abrasion, sharp edges and surfaces, and cyclic tension wear. This is the hardest to judge. Samson provides a visual pocket guide that shows the various stages of abrasion from mild to extreme. In this case a picture is worth a thousand words! As a rule of thumb, Samson suggests that you repair your rope if the damage is in localized areas and retire it if the damage is over extended areas of the rope. 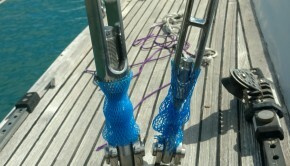 Splice rope should you choose to repair a damaged section. Add Dyneema® sleeves to high chafe areas of the rope. Recover rope if the core is still intact but the outer sleeve is damaged (this is often less expensive than buying new rope). 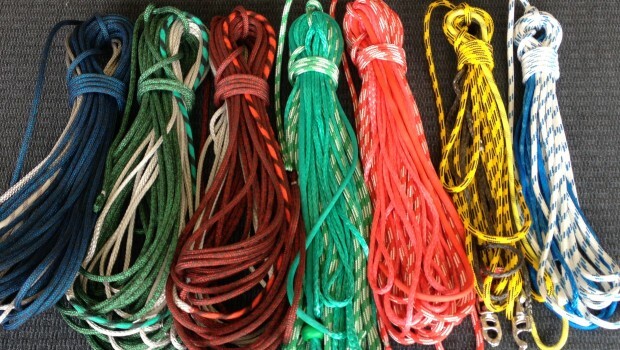 Help you purchase new rope from our incredible selection of strengths, colors, materials and brands. And remember, never throw away old rope. You can always use it for dock lines or to tie a Christmas tree to the roof of your car!